When changing your liner it is best practice to at least change your gaskets on all your fittings. However why pair a nice new liner with old faded face-plates. Refresh your whole pool with a refurbishment kit when you buy your new liner. 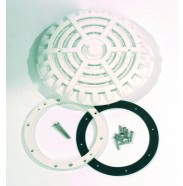 At 1st Direct Pools we stock all replacement parts and refurbishment kits for the Certikin range of fittings. If you have any other kind of fitting or don't know what you have please call our technical team on 0333 900 4040 who will be very happy to assist you further.